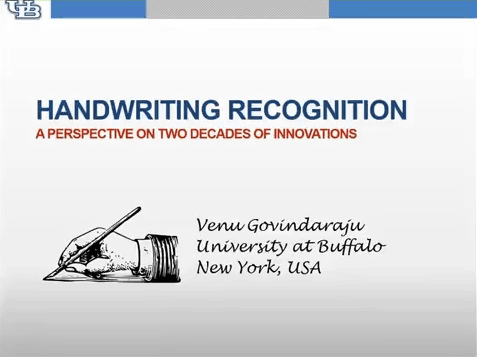 We present an overview of two decades of innovation in handwriting recognition at the Govindaraju lab at the University at Buffalo and offer a perspective on the evolution of research in this area and the future of the field. 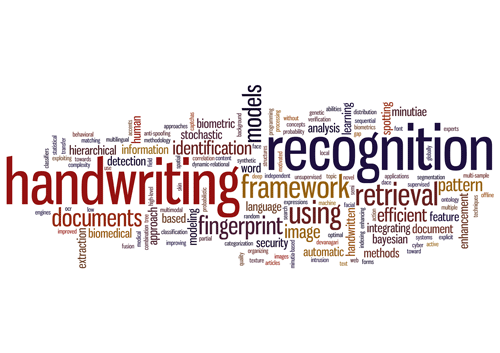 We highlight our seminal work in handwriting recognition that was at the core of the first handwritten address interpretation system used by the U.S. 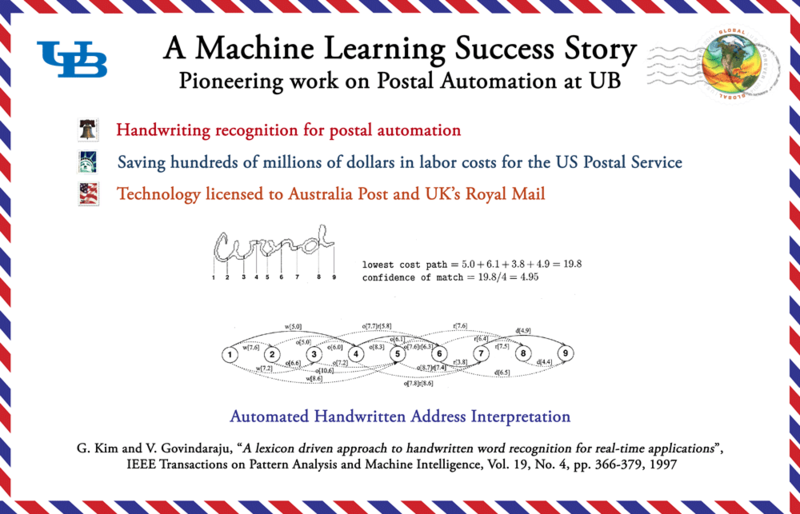 Postal Service, described as one of the first practical success stories of AI (Daphne Koller, Stanford, at the CCC symposium on Computing Research that changed the World) and as a shining example of AI for the Social Good (Eric Horvitz, Microsoft Research). 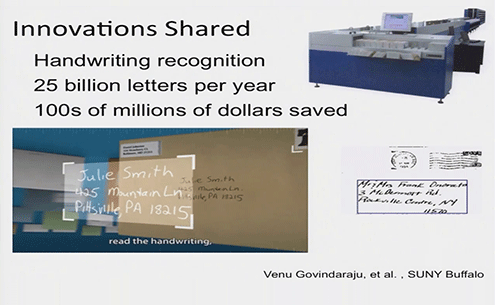 Dr. Govindaraju's postal research was highlighted in a keynote by Eric Horvitz at the CCC workshop on AI for Social Good. Horvitz received his PhD in 1990 and his MD degree at Stanford University. He is currently Technical Fellow at Microsoft, where he serves as director of Microsoft Research’s main Redmond lab. He has been elected Fellow of the Association for the Advancement of Artificial Intelligence (AAAI), the National Academy of Engineering (NAE), the American Academy of Arts and Sciences, and of the American Association for the Advancement of Science (AAAS). He was elected to the ACM CHI Academy in 2013 and ACM Fellow 2014. He serves on the Scientific Advisory Committee of the Allen Institute for Artificial Intelligence (AI2) and is also chair of the Section on Information, Computing, and Communications of the American Association for the Advancement of Science (AAAS). He has served as president of the Association for the Advancement of AI (AAAI), on the NSF Computer & Information Science & Engineering (CISE) Advisory Board, and on the council of the Computing Community Consortium (CCC). The National Academy of Inventors (NAI) is a national non-profit organization, which includes around 145 member institutions and approximately 3,000 individual members and Fellows. The academy holds an annual conference and an annual awards ceremony during which it inducts new Fellows. 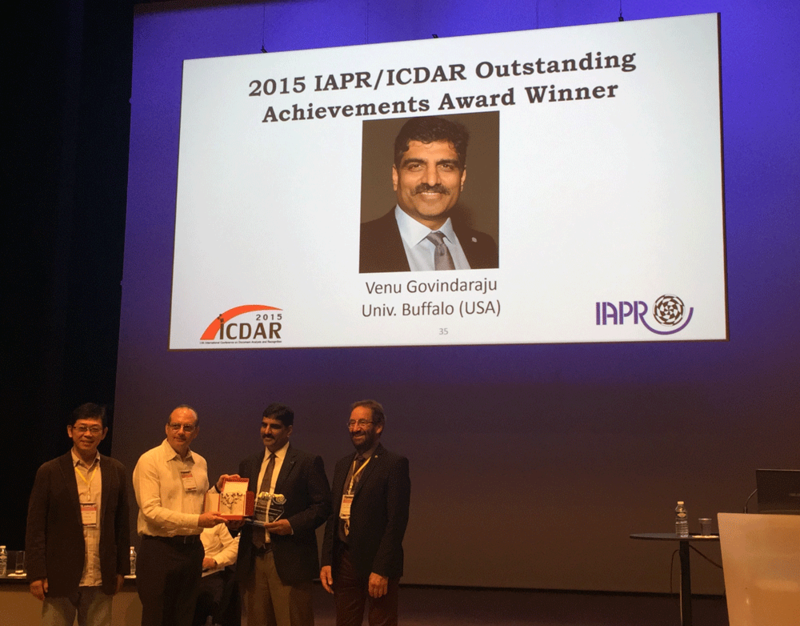 Dr. Govindaraju was named a Fellow of the National Academy of Inventors in 2015. Dr. Venu Govindaraju, SUNY Distinguished Professor of Computer Science and Engineering, is the founding director of the Center for Unied Biometrics and Sensors. His research focus is on machine learning and pattern recognition applied to the the domains of Document Image Analysis and Biometrics. He has co-authored over 400 refereed scientic papers and his seminal work in handwriting recognition was at the core of the handwritten address interpretation system used by the US Postal Service. This work has been recognized as one of the most successful applications of Machine Learning in the development of a real-time engineered system. He is a recipient of numerous peer honors and has been elevated to the Fellow grade of prestigious societies such as ACM, IEEE, AAAS, IAPR, and SPIE. 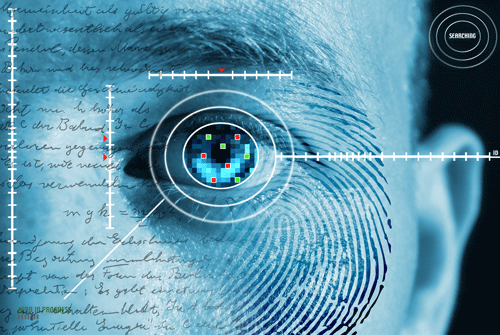 Dr. Govindaraju has been able to consistently attract and fund the brightest and most talented students and provide them with the opportunity of working on exciting research topics in document recognition and other language technologies as well as biometrics. His students have moved on to academic tenure-track positions as well as positions at top technological companies such as Google, Yahoo Research, eBay Fujitsu, Siemens and Raytheon BBN Technologies. 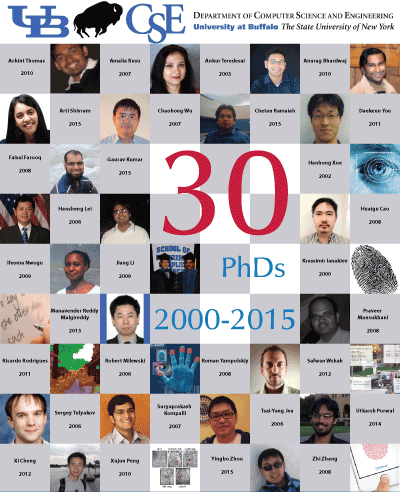 His keen desire to mentor and nurture motivated students has resulted in his graduating 30 doctoral students over the last 15 years, a remarkable record that we are proud to celebrate.